Things happen to be quite gaudy in circuses, and Gancino Circus are no exception, at least when it comes to their music where Balkan beats, Klezmer sounds and Frankish folk music clash happily. Their album tells the story of the fictitious Baron von Gunzenhausen of old German noble stock whose story has been forgotten over time. The potpourri consists of thirteen tracks that tell of his numerous journeys through Europe. Gankino Circus are four musicians who rather play in pedestrian zones or village fairs than on regular stages. They have been touring quite a lot through Western, Middle and Eastern Europe from which they brought many of their influences. The idea sounds incredibly alluring, but the implantation sometimes lacks cohesion. For instance the record contains too many instrumental parts, which is a shame when the musicians are such good singers. I don’t doubt the musicians’ abilities, but the ten minute long Opus definitely suffers from its exaggerated length. The info sheet picked out three songs which are definitely the best material on the album. The record label should have put more pressure on the band to deliver more of these smashers. The band is at their best when they play their colourful songs full of polka rhythms. The swift clarinet happens to be also perfectly integrated. Their interpretation of the Jack White schlager classic Fahrende Musikanten, with the band slowing their pace, somehow even reminds of Eläkeläiset. 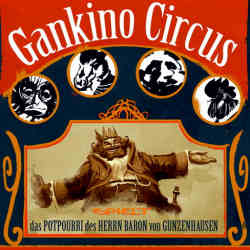 Too often though Gankino Circus act darker and avant-garde in a certain Kurt Weill fashion. The idea is splendid, but the execution has still room for improvement. As Gankino Circus is definitely doing their own things and not trying to copy popular patterns, the rating should not be too severe. It would still be nice if the band tried to sound a little catchier in the future.